Discussion in 'Feedback' started by Phillip, Jan 28, 2014. Happy birthday! Muppet Central is now 16 years old. Sweet 16! The site debuted 16 years ago on January 28, 1998. Back when the site first started The Jim Henson Company still owned all of their original properties including the Muppets and Sesame Street. 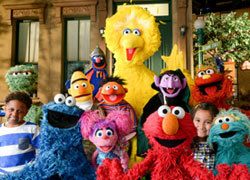 Two new feature films were in development simultaneously, Muppets From Space and Elmo in Grouchland. The Children's Television Workshop was gearing up for their upcoming 30th anniversary and The Jim Henson Company was developing an ambitious sci-fi series that would eventually become Farscape. Even though many changes have occurred throughout the EM.TV and Disney years, we’ve been honored to be a small part of it and to provide a place for fan discussion and interaction. We want to thank all of the staff, past and present who have given so much of their time and giftings to make Muppet Central a great place. Every member here is a vital part of what makes Muppet Central special. Thanks for doing your part in keeping Jim Henson’s vision of the Muppets alive. We believe great days are ahead. While we’re celebrating sixteen years, we are also looking towards the future. 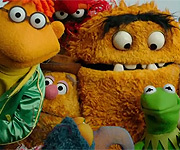 What do you think the future holds for the Muppets especially with their eighth (!) feature film on the horizon for March 2014? Sesame Street has rebounded well from a challenging year with the departure of two beloved veterans in Kevin Clash and Jerry Nelson in 2012. Fraggle Rock is even on the upswing with the premiere of the new Doozers show and classic merchandise. What is your prediction for 2014? Let us know! Dr TeethFan, Twisted Tails, Mister Muppet and 3 others like this. I'll talk about the year later, but the birthday menu is literally my favorite one of all. Happy Birthday MC love ya!!! Happy 16th birthday MC. So where do you guys want the Ferrari cake? I love this place, it's my online home and I want to help make it better... Dunno where such suggestions should be posted though. Haven't plugged in to MCR lately, but I smile that both the Happy Birthday from Sesame Street and Muppets Valentine Show songs are playing. Thanks for creating such a great place for Henson fans of all ages and all walks of life Phil. I'm with you Ed, and would love to hear your suggestions on how to make this place better as well. Happy Birthday Muppet Central! This is my third year here by now. I was supposed to be off of this forum for a long time, but I do come back here less and less. I am happy for MMW, FR classic merchandise... hmmm I will have to wait and see what kind of stuff that brings, Sesame Street has it ups and downs, but I agree with Phillip that the long-running series has rebounded or maybe rekindled from its wounds after losing their two favorite people that brought their characters to life. Some suggestions... I would definitely love to be one of those MC members to catch any of those spammers red-handed and face their imperial doom. : What color are their hands now? Beau, they are not caught yet, but I am letting everyone if I do find them. : When so I start shining up this forum? Just ask Ed, the moderator! He will probably tell you where to clean up. What else? Well, I am so glad to part of this forum. I LOVE the Muppet menu! Every single character in their tuxs or their suit and ties except Miss Piggy who wears a gorgeous silky black dress with lavender gloves going all the way up to her elbows. Thanks for sharing the announcement, Phillip! What a great way to start this year right. Sorry I'm late! Happy Birthday MC! Here's to many many more! I'm late too, but HAPPY BIRTHDAY!!!! Wow... Trying to resist the urge to calculate my age in 16 years... Too late, LOL. Katzi428 and LaniArianna like this. And a special thanks to Phil, Cindy & the mods. for keeping it intact!